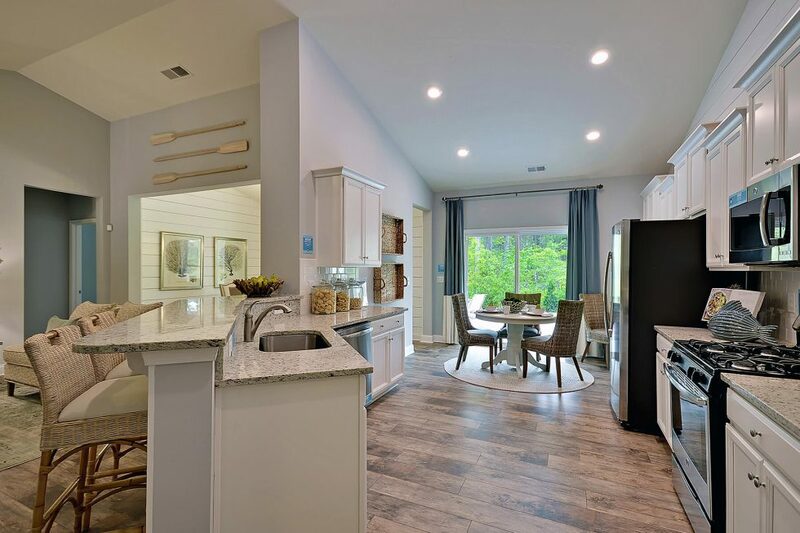 There are many innovations at Shearwater, a brand-new concept in master-planned living that combines an active outdoor lifestyle with community connectivity and robust amenities. Among the new offerings at Shearwater is the Crepe Myrtle plan from Lennar, one of five home builders chosen by community developer Freehold Communities to help create the signature Shearwater lifestyle. New to the Jacksonville area and currently only available at Shearwater, the beautiful Crepe Myrtle home includes approximately 2,223 square feet with three bedrooms, three bathrooms, a spacious gathering room and top-of-the-line kitchen. Complete with 9’ ceilings, this space will feel open and inviting for friends and family alike. Prices for this plan start in the low-$300,000s. The Crepe Myrtle was designed with plenty of room for entertainment and relaxation. Greet your guests and neighbors at the covered front porch before moving into the gathering room to watch the big game. The café provides extra seating and easy access to the large covered lanai, making backyard barbeques or restaurant-style family breakfasts almost effortless. Don’t forget the bonus room, which has the option to become a guest bedroom, game room, study or anything else your family needs. Just one of many floorplan options from Lennar at Shearwater, the Crepe Myrtle sets the bar high for others to come. Lennar is offering one- and two-story homes in Shearwater starting in the high $200,000s. With homes ranging in size from approximately 1,868-2,633 square feet with three to five bedrooms and two to three bathrooms, there’s something for every family at Shearwater. If you’d like more information on the Crepe Myrtle floorplan, or any of the homes Lennar is offering at Shearwater, please contact Pamela Samuels or Jeremy Deme at 904-380-0774. Lennar Homes’ models are open Sundays and Mondays from noon-6:00 pm and Tuesdays-Saturdays from 10:00 am-6:00 pm.